Oh, the stories they could tell, those young men who reach the pinnacle of Scouting by earning the Eagle Scout award. In fact, they get a chance to tell their stories at their courts of honor, the award ceremonies where they receive their Eagle badges. 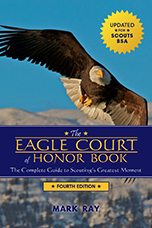 To help ensure that those ceremonies are the best they can be, I wrote and self-published The Eagle Court of Honor Book in 1996. I also developed a comprehensive website to promote the book and provide additional resources. Subtitled "The Complete Guide to Scouting's Greatest Moment," the book includes ceremony scripts, planning checklists, support job descriptions, and inspirational poems and quotations. Since 1996, more than 70,000 Scout leaders have relied on the book's three editions to make Scouting's greatest moment just a little bit greater. In 2003, I wrote and published a second book, The Scoutmaster's Other Handbook. In this unique and highly personal book, I offer hundreds of proven ideas for building strong, successful, sustainable troops that truly achieve the promise of Scouting. Beginning with Scouting’s aims and methods, the book moves quickly through every aspect of the program, from troop meetings and outings to fundraising and administration. To learn more, visit the books' website. 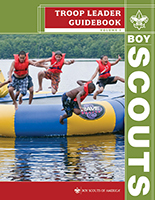 Most recently, I wrote the new, two-volume Troop Leader Guidebook, the replacement for the Boy Scouts of America's Scoutmaster Handbook, and the 13th edition of the Boy Scout Handbook. In 2015, my new versions of the handbooks for Bear Cub Scouts and Webelos Scouts appeared. I'm also co-author of Growing Up Right, Growing Up Strong...Parents, Kids, and Scouting, an e-book that supports the Boy Scouts of America's National Parenting Initiative. And I've contributed content to several yearbooks published by the National Eagle Scout Assocation.